E tosha owes its unique landscape to the Etosha Pan, a vast, shallow chalky-white depression of approximately 5000 km2 that forms the heart of the park. Once a large inland lake fed by rivers from the north and east, it dried up 120 million years ago as continental drift changed the slope of the land and the course of the tributaries. A series of waterholes along the southern edge of the pan guarantee rewarding and often spectacular game viewing. What we call Etosha today was proclaimed as Game Reserve No 2 in 1907 by the then German Governor Frederich von Lindequist. With subsequent additions it became the largest game reserve in the world, covering a vast area of ±80 000 km2. For political considerations its size was progressively diminished, until by 1975 it had been reduced by 77 per cent to its present surface area of 22 912 km2. Nevertheless, it is still one of the largest game reserves in Africa. Of the 114 mammals species found in the park, several are rare and endangered, such as black rhino and cheetah, and the lesser-known black-faced impala, which is endemic to north-western Namibia and south-western Angola. Etosha’s current population of black rhino represents one of the largest growing populations of black rhino in the world. Other large mammals in the park include elephant, giraffe, blue wildebeest, mountain and plains zebra, hyaena and lion. Cheetah and leopard complete the trio of ‘big cats’. Antelope species range from kudu, gemsbok and the large and stately eland, to the diminutive Damara dik-dik. Smaller mammals include jackal, bat-eared fox, honey badger, warthog and the ubiquitous ground squirrel. About 340 bird species occur in Etosha, about one third being migratory, including the European bee-eater and several species of wader. Larger birds include ostrich, kori bustard and greater and lesser flamingo, of which tens of thousands congregate on the pan to breed during a good rainy season. Ten of Etosha’s 35 raptor species are migratory. Those most commonly seen are lappet-faced, white-backed and hooded vultures, while sightings of the Cape, Egyptian and palm-nut vultures have been recorded. There are eight species of owl, including the pearl-spotted owlet and southern white-faced scops-owl, and four species of nightjar. For the greater part of the year (the dry season) Etosha’s animals and birds are dependent on about 30 springs and waterholes. These provide excellent game viewing and photographic opportunities. A good policy before setting out is to enquire from camp officials what the current game movements are. During the rainy season, the bird life at the main pan and Fischer’s Pan is well worth viewing. Etosha’s vegetation varies from dwarf shrub savannah and grasslands, which occur around the pan, to thorn-bush and woodland savannah throughout the park. Eighty per cent of all Etosha’s trees are mopane. West of Okaukuejo is the well-known Sprokieswoud – Fairy, Phantom or Haunted Forest – the only location where the African moringa tree, Moringa ovalifolia, grows in a flat area. 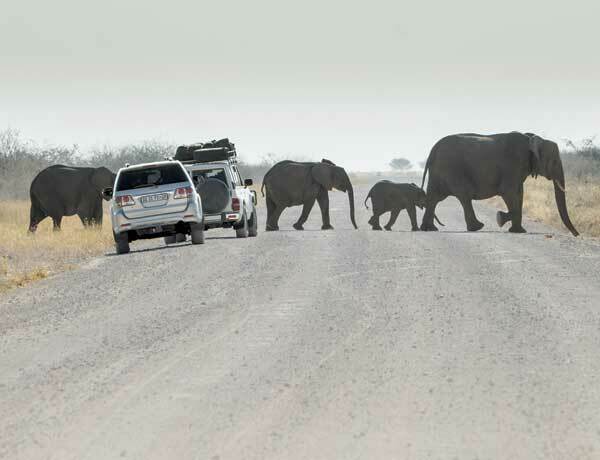 Etosha is open throughout the year and is accessible by tarred roads via the Andersson Gate on the C38 from Outjo, the Von Lindequist Gate in the east from Tsumeb on the B1, the Galton Gate in the west from Kowares on the C35 (open only to registered tour operators and guests to Dolomite Camp) and the King Nehale Gate located on the Andoni plains just north of the Andoni waterhole, which provides access from the north-central Owambo regions on the B1 from Onyati. The park has five tourist resorts – Okaukuejo, favoured for its floodlit waterhole where ‘specials’ such as elephant, giraffe, black rhino and lion can be viewed at night; Namutoni, characterised by the historic fort around which it is centred; Halali, situated halfway between Okaukuejo and Namutoni; Onkoshi Camp, an exclusive, low-impact, environmentally friendly tented camp about 25 km north-west of Namutoni; and Dolomite Camp situated in western Etosha. There are many lodges and guest farms close enough to Etosha to allow for day excursions into the park. Located near the Von Lindequist Gate, the eastern entrance to the park, is Mokuti Etosha Lodge, the Mushara Collection, Emanya@Etosha; and the 34 000-ha Onguma Game Reserve that adjoins Fischer’s Pan. The reserve offers a choice of five lodges, of which Etosha Aoba Lodge was recently completely renovated, The Fort underwent soft refurbishments, and a new campsite and private landing strip were added. On the southern edges of the pan, about a kilometre from Andersson Gate, lies Taleni Etosha Village, and Andersson’s Camp, situated in the Ongava Game Reserve. Located amidst a cluster of low hills is the town of Outjo, an important cattle-ranching centre and regarded as Etosha’s gateway to the south. Situated on the C38, Outjo is about 100 km from the Andersson Gate. The history of the town and surroundings is depicted in the Outjo Museum, where the focus is on gemstones and wildlife. The museum is housed in Franke House, built in 1899 for the German commanding officer, Hauptmann Franke. Other places of interest are the Naulila Monument, erected in 1933 to commemorate the 12 soldiers who lost their lives on 18 December 1914 under Major Franke; and the Water Tower, constructed in 1900 to provide fresh water for German soldiers, their horses, and the hospital. Bäckerei Outjo, a good place to stop for refreshments, offers tasty German delicatessen, while The Farmhouse, which is open from breakfast to dinner has a shady beer garden. The regional tourist information centre, Etoscha i Büro, is situated in Hage Geingob Street. Besides providing information on the town and surroundings, it also sells a large variety of local gemstones. Accessed from the B1 and situated about 96 km from the Von Lindequist Gate, the town of Tsumeb was founded in 1905. While initially closely linked to the mining industry, operations have been scaled down considerably. The colourful jacarandas, flamboyant trees and bougainvillea that line the town’s streets have earned Tsumeb the description of Namibia’s garden town. The history of the town is depicted in the Tsumeb Museum, where a comprehensive collection of rare minerals can be viewed. An interesting facet of the Tsumeb Museum is the Khorab Room, displaying a collection of restored cannons and other armaments dumped into Lake Otjikoto by retreating German forces shortly before the signing of the Khorab Peace Treaty. 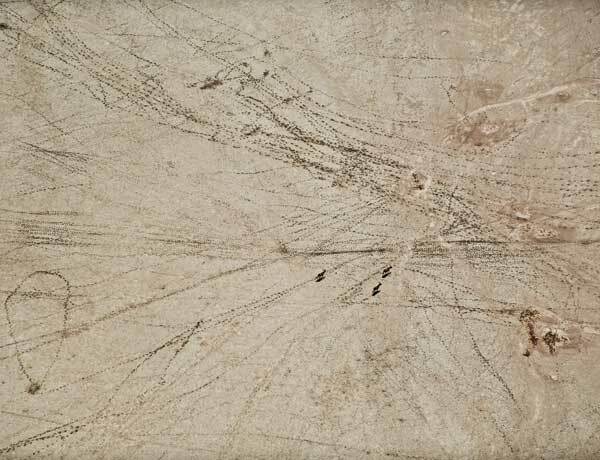 It is estimated that at least 30 cannons and 4 500 boxes of ammunition were plunged into the lake. The museum is housed in the former German Private School Building, constructed in 1915, and today a national monument. The Tsumeb Arts and Crafts Centre, situated in the main street, is run by an educational trust promoting traditional arts and crafts. An African style, open-air market on the outskirts of Tsumeb gives small traders the opportunity to sell their wares. The Arts Performance Centre is another popular attraction in Tsumeb. The Centre presents concerts, African dance, music, and typical play dramas from the north of Namibia for tourists. Shows can be booked at 067 22 0511. The Tsumeb Cultural Village, also known as the Helvi Mpingana Kondombola Cultural Village – named after founding president Sam Nujoma’s mother – is located in the southern outskirts of town. This community project is presented as an open-air museum, while exhibits display the life, history and culture of the majority of Namibians. The centre also hosts a curio shop and bungalows for overnight guests. The oldest building in town is the Otavi Minen und Eisenbahn Gesellschaft (OMEG) Minenbüro, completed at the end of 1907, while the Second Director’s House, erected in 1912, serves as the second-oldest building. The latter still houses some of the original furniture and retains its original appearance. St Barbara’s Roman Catholic Church, which was built in 1913, is one of the town’s most prominent landmarks. Popular places to dine or stop for a refreshment include the Etosha Café & Beergarten, Sindano Court, and Cosmos Nursery. The Tsumeb Airstrip meets International Civil Aviation Organisation standards and is the closest commercial airstrip to Etosha National Park. In October the town hosts its annual Copper Festival, linking back to its history as a mining town.